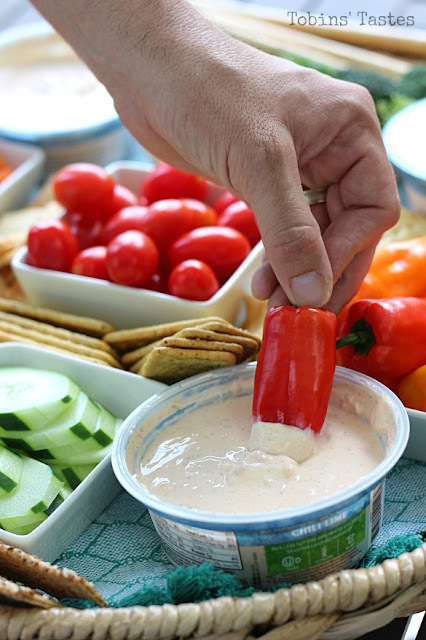 When it comes to entertaining, I am all about the appetizers. In fact, Justin and I love appetizers and tapas style food so much that we often have our own at home tapas nights instead of making dinner. Traditionally we throw a huge summer party around Memorial Day but this year with Easton, we really haven't planned anything. I'm am thinking we may play it by ear and have a few people over last minute if we are up for it which means I'll be looking for easy, day of recipes that I can throw together without a lot of prep or stress. 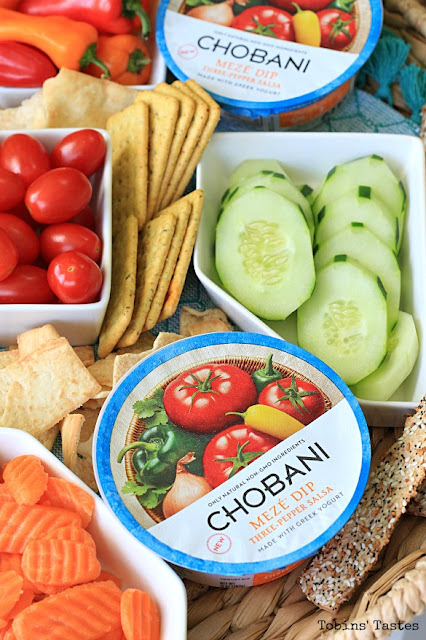 And this veggie tray with Chobani Mezé™ Dips is exactly what I'm thinking. As much as I love making cheese and meat spreads for our guests, summer time temperatures in Florida don't really lend themselves to heavy party dishes. 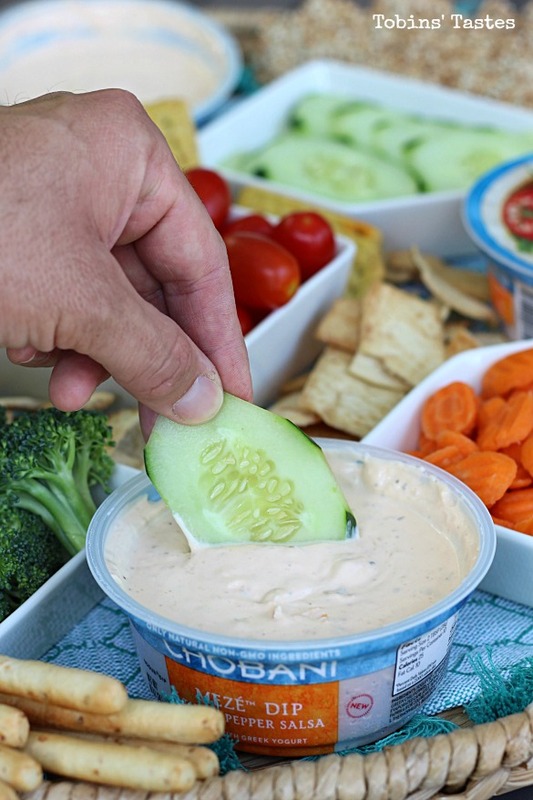 I love serving veggies with lighter dips but hate having to mix up the ingredients myself. 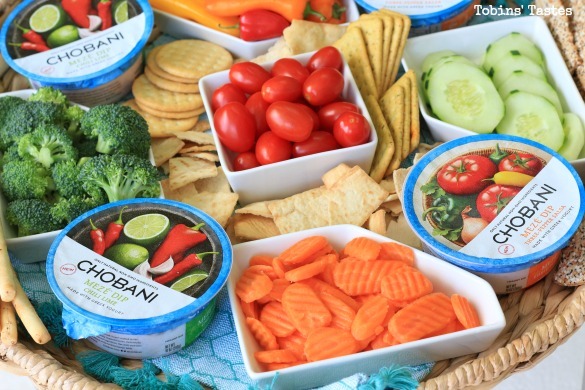 We already love Chobani's regular Greek yogurts so when I saw these new Meze dips at my local Walmart I had to try them. My Walmart has a great selection of organic and traditional pre-chopped veggies which made making this tray even easier. I literally grabbed bags of veggies, some breadsticks, pretzels and pita and a few dips and was done. 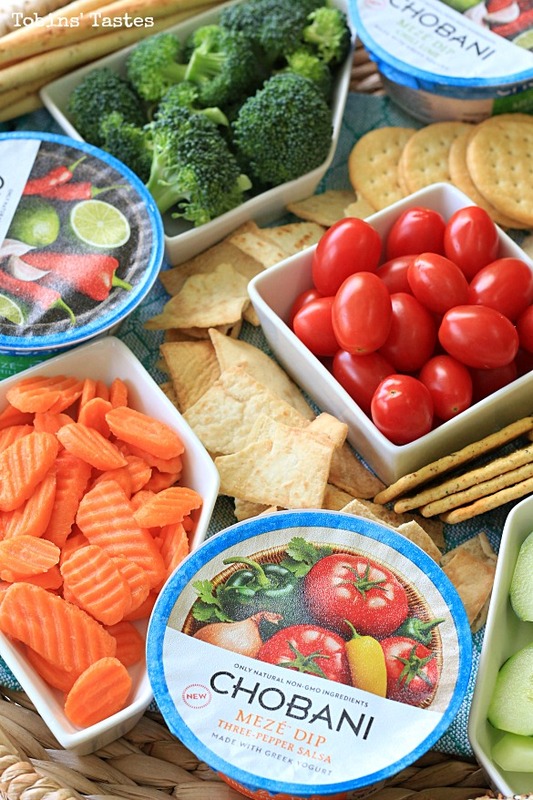 The best part about all of these things is that even if you don't end up having people over they are all things you can eat throughout the week so nothing goes to waste. I keep a couple of large trays on hand at home to use for things like appetizer and dessert trays so I just grabbed my summeriest looking one and put a bright colored placemat on it. 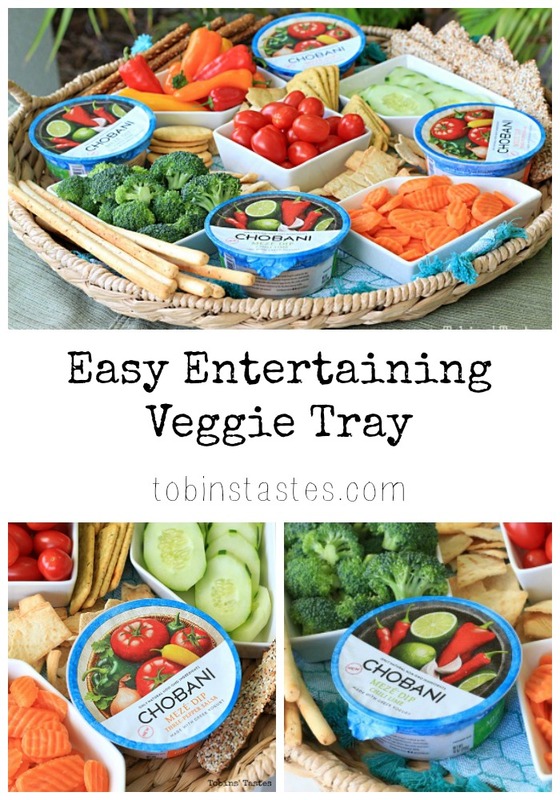 I then used an assortment of glass dishes for the veggies and kept the dips in their trays- no extra dishes to wash and they come with handy plastic lids that you can save to store the leftovers back in the fridge with. 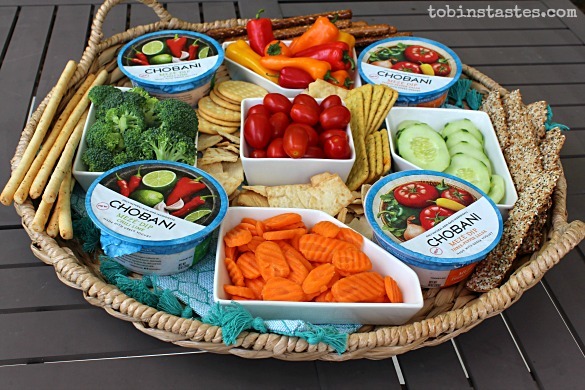 This tray is so easy to customize based on your preferences or what you have on hand in the fridge/pantry. The Meze Dips are great for warmer weather because they are so cool and refreshing and I love that are made with only natural, non-GMO ingredients. We brought this tray to my cousin's graduation party and people couldn't get over how good the dips were. With all the delicious but not always so great for you party food being served this time of year, I think people loved having a better-for-you option. Just a heads up, these dips are found in the deli department so don't be discouraged if you can't find them with the rest of the yogurts. Right now you can print out a $1 off coupon so be sure to take advantage of it and stock up! 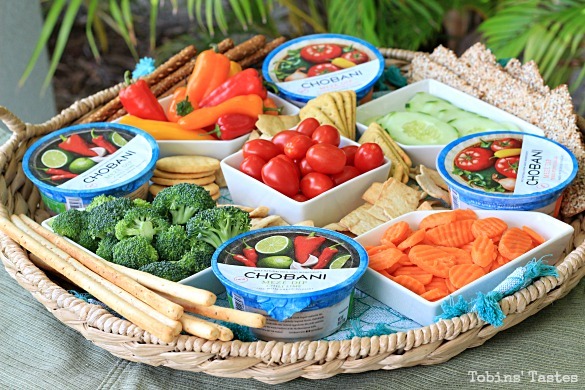 What are your favorite easy party foods? Any big plans for Memorial Day Weekend? I'm interested in reserving this beautiful place. Placing a music show which does not have cultural preferences becomes difficult in a banquet hall environment. It requires planning and decorating imagination. These event halls for rent have the right décor for any event.